We figured it would be nice to give everyone a refresher on what things have changed for the Pens since the Flyers shellacked them out of the playoffs in April. That's right, the Penguins haven't played hockey since April 22, 2012. Yikes. Wells Fargo Center and Hulk Hogan doing his best Cy Clark impersonation. Just thinking about this series again makes my stomach turn. Crosby only tallied eight points for the series, and was held without a point the final two games. Flower was a lost boy. He's 8-12 in his last 20 playoff games. Turnovers, no special teams, letting emotions take over... just an ugly series leaving a team with plenty of questions. What next? The trade everyone seemed to know was coming. Ray Shero delt Jordan Staal to brother Eric in Carolina for Sutter, defenseman Brandon Dumoulin and the 8th overall pick (defenseman Derrick Pouliot). Remember, the draft was held in Pittsburgh. Shero pulled that trigger in his barn. Also remember, the trade was made the same day Staal got married. Best of luck to Staal. 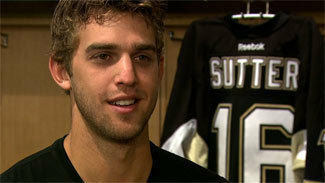 Enter Sutter. You're talking about one of the best two-way players in the NHL now in Pittsburgh. Crosby, Malkin, Sutter still sounds like a tough line of centers any opposing team needs to game plan around. A true center ice shutdown guy. Fans won't miss Staal when they see this guy skate. No more Asham. MacIntyre will live in WB/S. Look for Glass to be the new "enforcer" for the Pens, along side Deryk Engelland. Big difference in Glass from Asham is, well, skill. Asham was clutch at getting under the opposing team's skin, but wasn't much of an offensive threat. With Glass, the Penguins get someone who can actually skate and will drop the gloves if needed. MAF needed the help. Brent Johnson is an amazing human and always good for an honest soundbite, but he just wasn't getting the job done backing up Fleury. With the addition of Vokoun, you still get a seasoned veteran between the pipes. The past three seasons Vokoun has averaged 55 games as a starter. Now in a backup role, he'll be sure to thrive giving Fleury needed days off without fear of the team leaving points on the ice. The Penguins have a lot of young talent sitting at the team's NHL roster doorstep. And their depth at the blue line is...well...deep. Simon Despres, Joe Morrow, Dumoulin, Brian Strait are all viable candidates to make the team in camp. Beau Bennett has been rolling, leading the Baby Pens with 23 points (6G, 17A). Even Eric Tangradi is making waves with 10 goals on the year, second best on the Baby Pens. It's good to know the Penguins have depth in case of injuries, but don't be surprised if some of these guys make the show. All the talk, Vegas betting lines and predictions don't mean a thing. The Penguins needs to right the ship and become a dominate post-season force again. And it all starts on January 19. So excited hockey is coming back! PENS!! !